I bought this book on sight at Barnes & Nobel the other day. It is honestly hard to read, and I have problems with a lot of the illustrations, too. Once I tap everything I take issue with, I'll provide a point-by-point breakdown of why this new book might not be worth your money. You wouldn't know a good book, can you read? Hey, Anonymous! Good to see you're keeping it real, as always! I have to say, I'm not sure what to call that grammatical error, but I'll be sure and look it up. I think it might be a comma slice. Zach, I'm looking forward to this. I think I'll be buying this one no matter what, but it'll be good to have a critical perspective on things, especially if it keeps me from plagiarizing inaccurate material. I bought the book and overall liked it, but much of it was a shock. 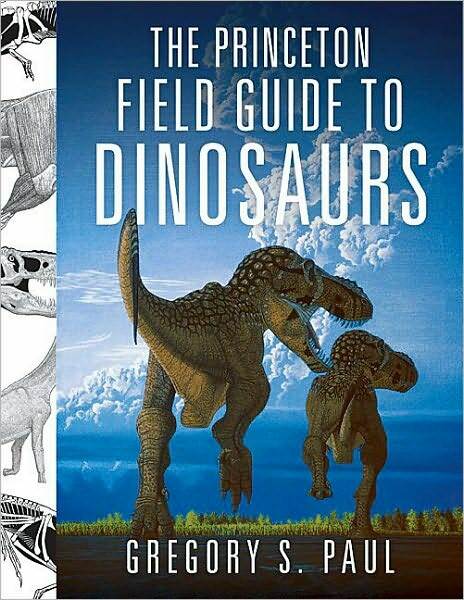 Yes, I was very disappointed by Greg Paul's new field guide. In fact, some of his sauropod skeletals are just plain inaccurate (I have complained about this to the DML and got quite a nasty response from Greg Paul himself), and I know this because in some cases the actual published literature contradicts his restorations. If you ask me, the worst life reconstruction in the book is that of the cartoonish Beipiaosaurus. I'm no so bothered by the lumping simply because the definitions and uses of genera are completely arbitrary anyways--one person's genera is another person's species. One thing that seems to irk quite a few people is the fact that Paul lumped many of the centrosaurines into Centrosaurus proper. That doesn't really bug me too much because the genus that contains the horned lizards (Phrynosoma) contains similar ornamental variation and are all lumped in one genus. See here. But, to each his own. The thing that bothers me about the lumping is the inconsistency. He lumps all the centrosaurines into Centrosaurus but doesn't do the same thing for Chasmosaurines (although he does lump a fair number into Chasmosaurus). Given that lump-festation, I'm surprised he didn't just name all the coelophysids Coelophysis, or the herrerasaurids Herrerasaurus. It's that kind of thing that bothered me. And yes, the Beipiaosaurus is pretty horrible, especially the life restoration. The sauropod skeletals are actually pretty good up until the titanosaurs... out of those only Opisthocoelocaudia, Saltasaurus, and Alamosaurus are good. They rest have VERY exaggerated proportions relative to the actual fossils. In Futalognkosaurus there are several errors, especially in the hips and the first caudal, which looks nothing like in the pictures. Huabeisaurus and Rapetosaurus overall have a lot of problems with proportions. With Chasmosaurines he mixes up Chasmosaurus belli and Chasmosaurus russelli. Also lumping Chasmosaurus Kaiseni as an "immature" specimen of C. russelli (falsely labeled C. belli) is wrong since C. kainseni (or its type skull at least) is bigger than the skuls of both C. belli and C. ruselli, and of the two, is closer to the curved-horned C. belli than the nearly hornless C. russelli. These are a couple of issues I found in the book aside from the rampant Centrosaurine lumping... and lumping of Torosaurus. Another thing I don't agree with is the extremely thick hadrosaur necks with all that speculative flesh... Camels have a similar "dip" near the base of the neck that isn't all filled up with a vat of muscle. The huge nuchal tendons on brachiosaurs and mamenchisaurs are another issue (though less major), these necks are supposed to be very light and pneumatic anyway so I don't see the need for holding them stiff and diagonal with a big nuchal tendon... Paul got it right in the 80s with the vertical s-curve necks IMO, it was not necessary to reinvent the wheel. The rest of the theropod restorations though, for the most part, were phenomenal. Especially all the big predators and the dromaeosaurs. I just got the book today, and I am happy I did, it looks like a great deal of work went into it. However I do question the merits of only restoring the most completely known dinosaurs of each group, when reconstructions of their less complete relatives could be greatly illuminating to the arguments being presented. For example Paul claims that "Omeisaurus" tianfuensis and "Mamenchisaurus" hochuanensis & youngi probably do not really belong to those genera... but he never shows us a picture of what a "true" Omeisaurus or Mamenchisaurus may have looked like, quite frustratingly. Since you know so much, why not write your own book. Tho I would doubt you have anything worthwhile to write about. I would prefer a review by a professional, not from a bunch of wannabees. Anonymous: Hi! I disagree with your assertions. 1) I actually can read, which has led to my ability to write...this blog...among other things. So your first comment doesn't really make sense. 2) It's funny you should bring that up. I'm in the process of drafting a book about ceratopsians and have been given the oppotunity to co-author a technical paper but I can't really go into the details because things are so early in the going. 3) I'm sure you can find professional reviews online and in print journals! Nobody's forcing you to read my forthcoming review by any means. 4) If you continue this kind of useless ranting, I'll happily delete every post I see from you, so there's that. Okay, that's it! Have a good day. Do as you wish, I just deleted your worthless blog. Trolls will be trolls, a bunch of name calling and ad hominem insults are no substitute for a reasoned explanation of disagreement on specific points. Not everyone's going to agree with any one scientist 100%, that doesn't make us all idiots. And I'm saying this as a big fan of Greg Paul's work. The book looks like it was rushed, so we're not getting Greg's best stuff on every single page (setting aside the lumperism)- the quality is superb in some parts (the ones where his skeletals were done years earlier and he had time to refine them) but the quality is far from consistent throughout. The publisher set a very tight timetable (and probably other constraints) and didn't give Greg Paul a fair opportunity to be Greg Paul. As a result, a lot of the newer skeletals (especially the titanosaurs) suffered. Plus there are some skeletals that did NOT get included in the book, and several fairly complete species that were not figured at all despite being listed in the book. The bad part of the internet is it gives everyone a platform, when it would be best that they not be heard. Not everyone has words of wisdom to share, of course they all thing they do. The Troodont section also took some hits. 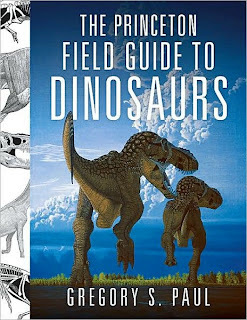 The book mentions Stenonychosaurus and Troodon itself in a couple of other animal's descriptions, and their listed in the index at the back, but they're nowhere to be seen in the actual catalog. Greg Paul usually produces excellent work, and this was still certainly an overall good book, but, frankly, it kinda feels like a "Predatory Dinosaurs of The World, V.2. : Now With Herbivores! ", if you catch my drift. The bad part of the internet is it gives everyone a platform, when it would be best that they not be heard.Not everyone has words of wisdom to share, of course they all thing they do. Nima, seriously where do you get your information from? Because its so wrong, so often. Where as Paul's C. belli is the specimen ROM 843, at least the skull is, Idk if there's postcrania attached to that specimen. Anyway, Godfrey and Holmes describe the specimen and assign it to C. belli. Again this is based on the specimens parietal morphology; "Parietal frill with nearly straight transverse posterior bars, each bearing one large triangular epoccipital on its posterolateral corner; other parietal epoccipitals variable in number and degree of coossification with the parietal, but always much smaller. The lateral bar of the parietal completely encloses the parietal fenestra." The state of the horn cores is not particularly useful for distinguishing species in Chasmosaurus. There are diagnostic specimens of both species demonstrating the reabsorbed condition, including the holotype of russelli (CMN 8800), and the referred belli specimen ROM 843. Also fyi, both CMN 8800 and ROM 843 are larger than AMNH 5401(kaiseni.) Although, that fact in and of its self is meaningless at the moment because as Ive said before larger size does not necessarily correlate with a more advanced age. Godfrey and Holmes are also the first, I believe, to synonymize kaiseni with belli. Prior to this it had been suggested that kaiseni, UALVP 40 and Eoceratops canadensis were synonymous, with canadensis having priority. Godfrey and Holmes synonymize all under belli with out much discussion other than saying that kaiseni shows the same morphology as belli, ie the straight transverse posterior bars. In reality none of these specimens preserve the posterior parietal in full, with kaiseni having a just a couple of fragments. C. kaiseni has since been referred to Mojoceratops, but the specimens included in the Mojo hypodigm are quite probably just various ontogenic stages of C. russelli after all.